In this month’s edition of Budget Travel (available on newsstands now), I reported a piece for the magazine’s Dream Trips issue, about the stunning ruins of Petra in Jordan. You may remember hearing about my trip there last year. The story is less narrative, more service journalism — a site by site description of what to see and do and how to see and do it. I also produced a video feature to accompany the written story. The article describes the park’s more spectacular monuments and natural features, beginning with the Siq, the sliver of canyon that winds down to the ancient city. 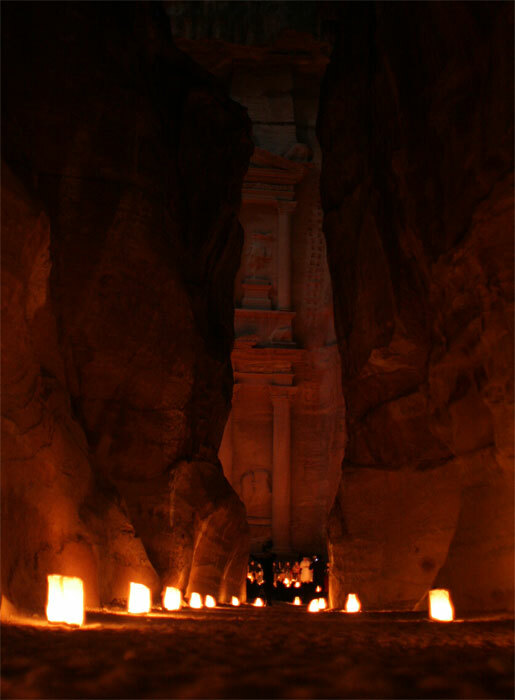 It also features Petra by Night, when thousands of paper bag luminarias light up the canyon walkway, leading to Al-Khazneh, the Treasury, with its brilliant facade glowing orange in the cumulative blaze of candles. The photo of Petra by Night in the magazine is one I took as we neared the Treasury. J, K, B and I hung back to avoid the chattering masses, and we got some nice time exposures along the way. Jack used a tripod to get some great shots. I borrowed K’s little mini-tripod to get this one. As devoted readers of this blog may recall, I took my video camera to Petra, and hauled it in a backpack on a couple of the longer hikes I took. Some of my footage appears in the narrated video tour of Petra on Budget Travel’s site. The tour video appeared online about the same time the video from Cairo (to complement a Michael Slackman story on Islamic youth) went up on the New York Times site. I was all over the Middle East last week. Online at least. You do get around. I better get cracking if I want to maintain my lead in Strip Passport. What craig fails to mention is that he loaned me HIS tripod so I could get those shots and he made do with the little one we had.